Radiotherapy has played a limited role for the treatment of human esophageal cancer owing to the risk of tumor radioresistance. Core 1 β1, 3-galactosyltransferase (C1GalT1), which catalyzes the formation of core 1 O-glycan structures, is frequently overexpressed during tumorigenesis. However, the exact effects and mechanisms of C1GalT1 in the radioresistance of esophageal cancer remain unclear. In this study, Public databases and our data revealed that C1GalT1 expression was up-regulated in esophageal cancer tissues and was associated with poor survival. Upon irradiation, we found that esophageal cancer cells with high levels of C1GalT1 could tolerate cell death and had increased resistance to radiotherapy. Irradiation also promoted the expression of C1GalT1 and core 1 O-glycan structures. 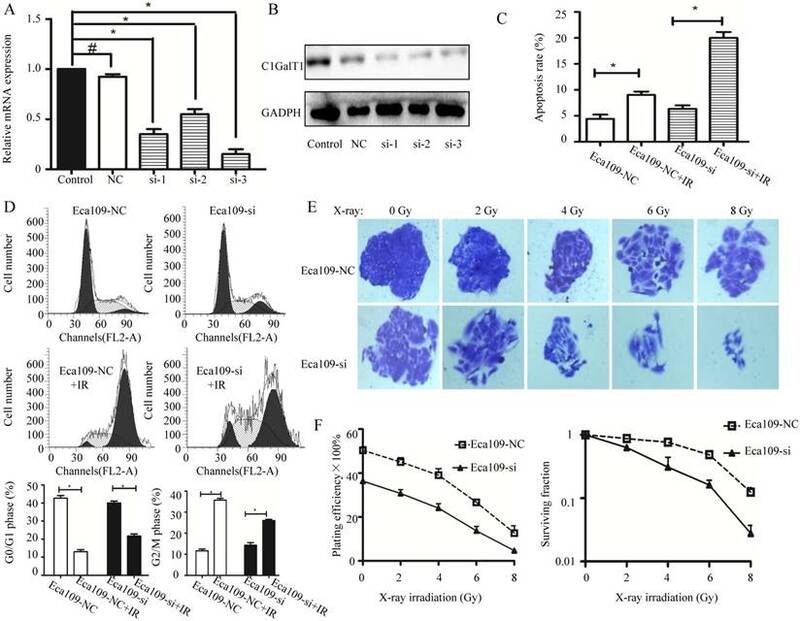 C1GalT1 knockdown increased the radiosensitivity of esophageal cancer cells, and attenuated irradiation-enhanced migration and invasion. Mechanistic investigations showed that C1GalT1 modified O-glycan structures on β1-integrin and regulated its downstream focal adhesion kinase (FAK) signaling. 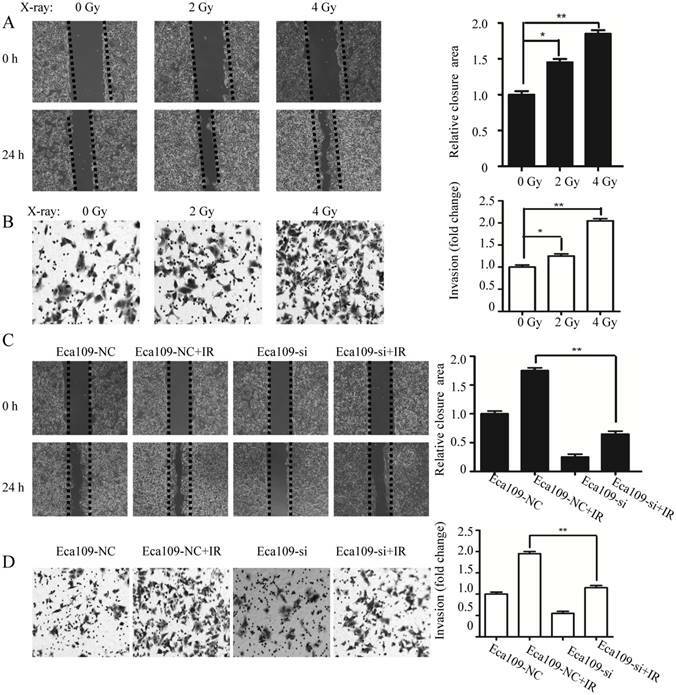 Furthermore, β1-integrin-blocking antibody and FAK inhibitor enhanced radiation-induced apoptosis in esophageal cancer cells. Together, our results indicate that C1GalT1 is a major determinant of radioresistance via modulation of β1-integrin glycosylation. C1GalT1 may be a potent molecular target for enhancing the efficacy of radiotherapy. Esophageal cancer is a common malignant tumor worldwide with a high incidence rate in China [1, 2]. Radiotherapy is one of the main treatment modalities for patients with esophageal cancer. However, the recurrence and metastasis rates still remain high and the therapeutic outcome of most patients is often not satisfactory . Radioresistance is a major obstacle that limits the efficacy of radiotherapy. Thus, understanding the mechanisms of radioresistance is essential to improve the survival rate of patients. Glycosylation is one of the most prominent post-translational modifications of proteins. Glycosylation plays a crucial role in key pathological steps of tumor development and progression . Aberrant glycosylation is often observed as a hallmark of cancer [5, 6]. Abnormal glycosylation is not just a consequence, but also a driver of the malignant phenotype, directly impacting key processes including cell adhesion, migration, cell-cell recognition and immune evasion . Several studies observed that altered glycosylation is related to the acquisition of multidrug resistance phenotype [8-10]. Especially, more and more studies have shown that aberrant glycosylation may be linked to treatment failure in many patients after radiotherapy [11-15]. The majority of glycosylation reactions are catalyzed by the actions of glycosyltransferases. These enzymes typically transfer single sugar residues from nucleotide-sugar donors to protein and sugar acceptors, the latter resulting in glycan elongation forming a vast array of glycan structures . Therefore, identification of differentially expressed glycosyltransferases contributing to aberrant glycosylation is critical in overcoming radioresistance. Core 1 β1,3-galactosyltransferase (C1GalT1) transfers galactose (Gal) to N-acetylgalactosamine (GalNAc) to form the Galβ1-3GalNAcα1-Ser/Thr (core 1 O-glycan structure) .The expression of C1GalT1 is commonly up-regulated during tumorigenesis, including hepatocellular carcinoma , breast cancer  and colon cancer . In this study, we investigated the effects of C1GalT1 on the radioresistance in esophageal cancer and the underlying mechanisms. The results showed that inhibition of C1GalT1 may sensitize esophageal cancer cells to radiation. Fresh-frozen human esophageal cancer tissues were obtained from the Taihe Hospital, Hubei University of Medicine. This subject was approved by the Research Ethics Committee of Hubei University of Medicine (Hubei, China). All patients have signed informed consent. All experiments were conducted in accordance with the Declaration of Helsinki. Immunohistochemical (IHC) staining was performed as previously reported . Each tissue was incubated overnight with a primary antibody for C1GalT1 (ab57492; Abcam, Cambridge, MA, USA, 1:100) at 4°C. After washing with phosphate-buffered saline (PBS), each section was incubated with HRP-labeled goat anti-mouse secondary antibody (A0216; Beyotime, Jiangsu, China, 1:300) for 1 h at room temperature. IHC staining was achieved using 3,3'-diaminobenzidine and counter-stained with hematoxylin (Beyotime). C1GalT1 protein staining was quantified by two observers independently using an adapted immunoreactive scoring system (IRS).The publicly available Oncomine database (http://www.oncomine.org) was utilized to analyze the C1GalT1 mRNA expression profiles in human esophageal cancer tissues relative to their normal controls. Standardized normalization techniques and statistical calculations can be found on the Oncomine website . The human esophageal cancer cell lines ECa109, KYSE150, TE-1 were purchased from Cell Bank of Type Culture Collection of Chinese Academy of Sciences (Shanghai, China). The cells were maintained in RPMI-1640 medium or DMEM (Gibco-BRL, Carlsbad, CA, USA) supplemented with 10% fetal bovine serum (FBS) at 37°C in a humidified atmosphere. One day before transfection, ECa109 cells were seeded in 6-well culture plates at a density of 3 × 105 cells/well. Approximately 100 pmol of siRNA was transfected into ECa109 cells using Lipofectamine 3000 (Invitrogen, Carlsbad, CA, USA). Three C1GalT1 siRNA and one negative control siRNA were synthesized by GenePharma (Shanghai, China). The siRNA sequences used were: si-1, 5′-CCAGCCUAAUGUUCUUCAUTT-3′; si-2, 5′-GGGAGAAGAUUUAAGCCUUTT-3′; si-3, 5′-GCAGAUUCUAGCCAACAUATT-3′; and negative control, 5′-UUCUCCGAACGU GUCACGUTT-3′. Total RNA was isolated from cultured cells using TRIzol reagent (Invitrogen). Then 2 μg of total RNA was reverse transcribed to cDNAs using oligo(dT) primer and Superscript reverse transcriptase II (Invitrogen). The qPCR was carried out using SYBR Green Master Mix kit (Applied Biosystems, Foster City, CA). Primers for C1GalT1 were 5′-CTGCCGGGGAATAATCTGGG -3′ and 5′-GGGACTGGTGACCTTTGCTT-3′. Primers for GAPDH were 5′-CCAACCGCGAGAAGATGA-3′ and 5′-CCAGAGGCGTACAGGG ATAG-3′. The expression level of C1GalT1 mRNA was expressed as a ratio relative to the GAPDH mRNA in each sample. Protein was extracted from whole cell lysates and quantified using a BCA Protein Quantification kit (P0012S; Beyotime) as described previously . Equal amounts of protein (10 µg) were separated using 10% SDS-PAGE. The blotted polyvinylidene (PVDF) membranes were incubated with antibodies against C1GalT1 (ab57492; Abcam, 1:1000), GAPDH (AF1186;Beyotime,1:2000), β1-integrin(ab24693; Abcam, 1:1000), Try397 pFAK (sc81493; Santa Cruz Biotechnology, Santa Cruz, CA, USA, 1:800), Ser 473 pAkt (sc293125; Santa Cruz Biotechnology, 1:800) and biotinylated Jacalin (B1115; Vector Laboratories, Burlingame, CA, 1:1000). The membranes were probed with HRP-conjugated anti-mouse (A0126; Beyotime, 1:2000) or anti-rabbit (A0108; Beyotime, 1:2000) secondary antibodies or Streptavidin (A0303; Beyotime, 1:2000). Protein bands were further visualized using ECL reagents of Pierce (Thermo Fisher Scientific, Rockford, IL, USA). Cultured cells (1×106) were collected and stained with 20 μg/ml biotinylated Jacalin at 37˚C for 1 h. After washing with PBS, the cells were incubated with 10 μg/ml Phycoerythrin conjugated Streptavidin (SA5207; Vector Laboratories) at 4°C for 1 h in the dark. Then cells were resuspended in 500 μl PBS and analyzed on a FACScan flow cytometer (Beckman Coulter, Brea, CA, USA). Cultured cells were irradiated using an X-ray irradiator (X-RAD 320, Precision X-ray Inc.,North Branford, CT, USA) at Taihe Hospital, Hubei University of Medicine. The doses applied in the experiments varied from 0 to 8 Gy. Cultured cells (1×106) treated with 4 Gy irradiation were harvested. For apoptosis analysis, cells were double stained with Annexin V-FITC and PI (Beyotime). For cell cycle analysis, cells were fixed with 80% ice-cold ethanol and stained with PI in RNase A solution (Beyotime). Data were acquired using flow cytometry and analyzed using FlowJo software (version 7.6.5; FlowJo, Ashland, OR, USA). For colony formation assay, cells were seeded in 6-well plates (1000/well) and incubated for 24 h before being irradiated (0, 2, 4 ,6 or 8 Gy). After 14 days, colonies were fixed with 100% methanol and stained with 0.1% crystal violet (Sigma, St. Louis, MO, USA). The surviving fractions were calculated as published previously. The invasion assay was performed using Matrigel-coated Transwell chambers (8-μm pore size; Corning Costar, Bodenheim, Germany), as previously described . Briefly, cells (2×104) in 200µl serum-free DMEM were seeded into the upper part of the chamber, and 500 µl DMEM containing 15% FBS was added to the lower part of the chamber. Following 24 h of incubation, cells were fixed with 100% methanol and stained with 0.1% crystal violet. Cells on the lower side of the membrane were counted under a light microscope (Olympus BX41, Tokyo, Japan) at 100× magnification. For the wound healing assay, cells (1×105) were plated in 24-well plates and allowed to attach overnight. Scratch through the cell monolayer was introduced by using a 10 µl pipette tip. At the indicated times (0 and 24 h), images of the wound areas were captured under a microscope at 100× magnification. For lectin pull down assay, 1 mg total cell lysates were applied to Jacalin conjugated agarose beads (AL11153; Vector Laboratories) at 4°C overnight. For IP assay, total cell lysates (1 mg) were incubated with 10 μl anti-β1-integrin antibodies (ab24693; Abcam) and protein G sepharose beads (GE Heathcare, Chalfont, UK) at 4°C overnight. The pull-downed proteins were then subjected to Western blot analysis. HRP-conjugated anti-mouse secondary antibody or streptavidin were used in Western blotting. Data obtained from three independent experiments were analyzed using GraphPad Prism 5.0 (GraphPad Software, La Jolla,CA) or SPSS 16.0 (SPSS, Chicago, IL). The results were expressed as the mean±SD. Student's t-test and one-way ANOVA were used for comparison among groups. Overall survival rates were compared using Kaplan-Meier method. P<0.05 was considered significant. Data retrieved from Oncomine database showed that C1GalT1 mRNA was significantly elevated in human esophageal cancer tissues (n = 8) compared with normal tissues (n = 8) in datasets from Kimchi's group  (Fig. 1A). However, the cases examined in this group were not adequate. Thus, IHC staining was performed to investigate the protein expression of C1GalT1 in 57 human esophageal cancer and 18 tumor-adjacent normal tissues. It showed that C1GalT1 protein was more frequently overexpressed in esophageal cancer than that in tumor-adjacent normal tissues (Fig. 1B and C). High expression of C1GalT1 protein was positively correlated with TNM stage (P<0.05) and lymph node metastasis (P<0.05). There was no significant correlation between C1GalT1 expression and gender, age, size of tumor, invasion depth, or differentiation (Table 1). Kaplan-Meier curves of overall survival revealed that esophageal cancer patients with high expression of C1GalT1 had a poorer prognosis than those with low C1GalT1 expression (Fig. 1D). These results suggest an important role of C1GalT1 in esophageal cancer development and progression. Three esophageal cancer cell lines ECa109, KYSE150, TE-1 were exposed to X-ray irradiation at various doses (from 0 to 8 Gy). Cell survival was measured by a standard clonogenic assay (Fig. 2A and B). Cell apoptosis was assessed by Annexin V-FITC/PI staining using flow cytometry (Fig. 2C). Dose-dependent decrease in surviving fractions was found in all the cell lines. However, the surviving fractions were higher in ECa109 cells in comparison to KYSE150 and TE-1 cells when exposed to the same radiation doses. On the other hand, apoptosis percentages after exposure to 4 Gy X-ray irradiation were less in ECa109 cells than KYSE150 and TE-1 cells. These data indicated higher radioresistance in ECa109 cells compared with KYSE150 and TE-1 cells. Furthermore, qPCR and western blot analyses were used to detect C1GalT1 expression (Fig. 2D and E). Among the cell lines, ECa109 had the highest expression of C1GalT1 at both the mRNA and protein levels, which is in line with their capacities to tolerate X-ray irradiation. Taken together, these results suggest that esophageal cancer cells with high levels of C1GalT1 could tolerate cell death and has enhanced resistance to radiotherapy. 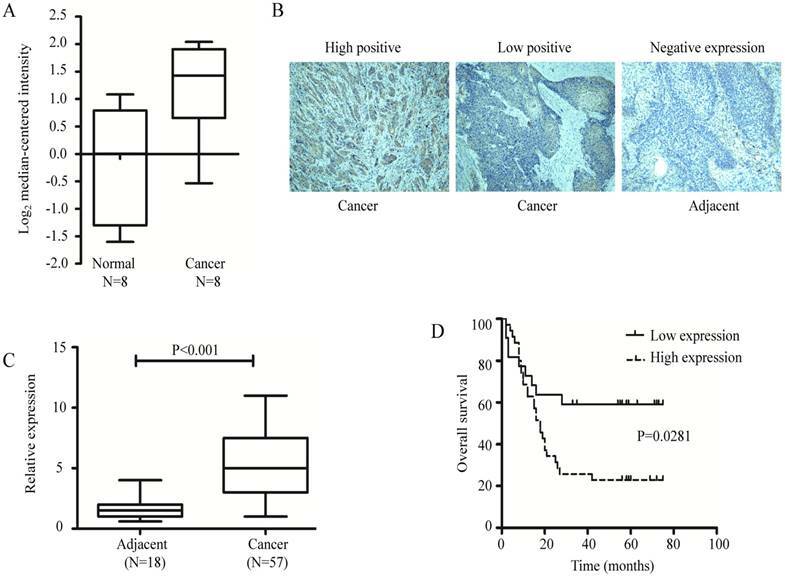 C1GalT1 expression is increased in esophageal cancer tissues and correlates with poor prognosis. (A) Search for C1GalT1 mRNA expression in Oncomine database. Fold change =2.564, p=0.007. (B) IHC staining for C1GalT1 protein in esophageal cancer and tumor-adjacent normal tissues (100×). (C) Analysis of C1GalT1 expression based on the immunohistochemistry score. (C) Kaplan-Meier survival curves for 57 esophageal cancer patients, grouped according to C1GalT1 expression levels. Relationship between C1GalT1 expression and clinicopathological features of esophageal cancer patients. C1GalT1 expression is associated with an enhanced ability to tolerate X-ray radiation. (A) The inhibitory effects of X-ray irradiation on cell survival were analyzed by colony formation assay (100×). (B) Quantitative analysis of the plating efficiency and survival curves of cells exposed to X-ray irradiation. (C) Cell apoptosis rates were determined by the Annexin V-FITC/PI binding assay 48 h after 4 Gy X-ray irradiation. (D) C1GalT1 mRNA expression in esophageal cancer cells was detected by qPCR. 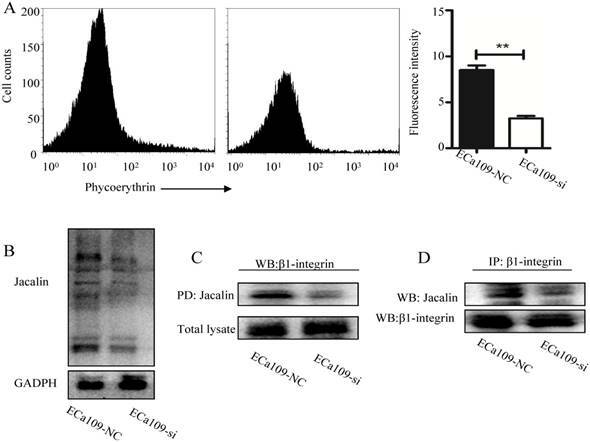 (E) C1GalT1 protein expression in esophageal cancer cells was detected by western blot. *P<0.05. ECa109 cells were exposed to X-ray irradiation at doses varying from 0 to 4 Gy. Radiation exposure was shown to cause a dose-dependent increase of C1GalT1 at both transcriptional and protein levels (Fig. 3A and B). To confirm this, C1GalT1 expression levels were also examined in other two esophageal cancer cells. The similar results were obtained from KYSE150 and TE-1 cells exposed to radiation (Fig. 3A and B). In addition, expression levels of core 1 O-glycans recognized by Jacalin lectin were analyzed by flow cytometry. ECa109, KYSE150 and TE-1 cells showed variable levels of O-glycan expression (Fig. 3C). Three esophageal cancer cell lines also exhibited significant differences in O-glycosylated glycoproteins from total cellular extracts as detected by lectin blot (Fig. 3D). The expression of core 1 O-glycans in ECa109 cells was relatively high among all cell lines. Moreover, core 1 O-glycans were significantly increased in ECa109 cells after exposure to low-dose X-ray radiation (0-4Gy) (Fig. 3E). It is evident that in ECa109 cells that are resistant to irradiation, low-dose X-ray radiation could promote the expression of C1GalT1 and core 1 O-glycans. Collectively, these results demonstrate a potential role of upregulated C1GalT1 in processes contributing to esophageal cancer radioresistance. To investigate the effects of C1GalT1 downregulation on the cellular response to radiation, C1GalT1 was knocked down by siRNA transfection in ECa109 cells. The qPCR and Western blot analyses revealed that the knockdown of endogenous C1GalT1 by si-1, 2, and 3 resulted in the reduction of C1GalT1 expression at both the mRNA and protein levels (Fig. 4A and B). Negative control siRNA exhibited no significant effect on C1GalT1 mRNA and protein levels. These data established the efficiency of siRNA transfection and identified si-3 as the most effective C1GalT1 siRNA.Then Eca109 cells transfected with negative control siRNA (Eca109-NC group) or C1GalT1 siRNA-3 (Eca109-si group) were exposed to different doses of radiation. The percentages of apoptotic cells exposed to 4 Gy irradiation for each group were as follows: Eca109-NC: 4.58 ± 1.03%, Eca109-si: 6.19 ± 0.42%, Eca109-NC + IR: 9.17± 0.55%, and Eca109-si + IR: 20.24± 1.53%. Knockdown of C1GalT1 in ECa109 cells showed a further decrease in relative viable cells induced by irradiation (Fig. 4C).The percentage of Eca109-NC cells arrested at G2/M phase markedly increased after irradiation(4 Gy), whereas the percentage of cells in the G0/G1 phase decreased. Compared with Eca109-NC cells, Eca109-si cells treated with the same dose of X-ray irradiation presented a reduced percentage of cells in G2/M phase and an increased percentage in G0/G1 phase. Knockdown of C1GalT1 in ECa109 cells affected the number of cells in the G2/M phase and G0/G1 phase following irradiation (Fig. 4D). After exposure to X-ray irradiation at doses ranging from 0 to 8 Gy, the survival fractions of Eca109-NC and Eca109-si cells were detected, as shown in Fig. 4E and F. Compared with the Eca109-NC cells, the survival fractions of Eca109-si cells were much lower at each dose. In addition, the clones formed by Eca109-si cells had fewer cells than clones formed by Eca109-NC cells, implying slower cell division. These results suggest that C1GalT1 downregulation enhances the radiosensitivity of Eca-109 cells. X-ray irradiation induces the expression of C1GalT1 and core 1 O-glycans in esophageal cancer cells. (A) C1GalT1 mRNA expression in esophageal cancer cells 48 h after irradiation was measured by qPCR. (B) C1GalT1 protein expression in esophageal cancer cells 48 h after irradiation was measured by western blot. (C) Expression of core 1 O-glycans was detected by flow cytometry. (D) Core 1 O-glycans were analyzed by Jacalin lectin blot. (E) Expression of core 1 O-glycans in esophageal cancer cells 48 h after irradiation was measured by flow cytometry. *P<0.05. Irradiation suppresses colony formation, alters the cell-cycle distribution, and induces apoptosis in C1GalT1 knock down cells. (A) C1GalT1 mRNA expression in esophageal cancer cells transfected with C1GalT1 siRNA or negative control siRNA was measured by qPCR. (B) C1GalT1 protein expression in each group was measured by western blot. (C) Cell apoptosis rates were determined by the Annexin V-FITC/PI binding assay 48 h after 4 Gy X-ray irradiation. (D)The cell-cycle phase distribution was analyzed 48 h after 4 Gy irradiation. (E) The inhibitory effects of irradiation on cell survival were analyzed by colony formation assay (100×). (F) Quantitative analysis of the plating efficiency and survival curves of cells exposed to X-ray irradiation. *P<0.05, #P<0.05. To investigate the effect of irradiation on cell migration and invasion, ECa109 cells were exposed to X-ray irradiation at doses varying from 0 to 4 Gy. Compared with unirradiated cells, the scratch wound closure of ECa109 cells was enhanced after X-ray radiation treatment (Fig. 5A).The number of ECa109 cells that passed through the basement membrane of the Transwell chamber was further increased (Fig. 5B). After exposure to 4 Gy irradiation, ECa109 cells transfected with C1GalT1 siRNA had significant slower motility (relative wound closure proportion) compared with cells transfected with negative control siRNA(Fig. 5C ). Matrigel invasion assay showed that Eca109-si cells also displayed a significantly lower transmembrane invasion activity as compared to Eca109-NC cells (Fig. 5D). These results suggest that knockdown of C1GalT1 could block irradiation-enhanced invasion in esophageal cancer cells. To identify whether C1GalT1 was involved in radiation induced aberrant expression of core 1 O-glycans, flow cytometry with Jacalin lectin was performed. As shown in Fig. 6A, knockdown of C1GalT1 suppressed Jacalin binding to cell surfaces of Eca109 cells. The intensity of Jacalin staining in Eca109-si cells was also reduced, indicating a dramatic inhibition of core 1 O-glycans, as expected (Fig. 6B). Since β1-integrin is a highly O-glycosylated protein expressed on cancer cells , we speculate that β1-integrin is a potential acceptor substrate of C1GalT1. To further investigate whether core 1 O-glycans on β1-integrin could be modified by C1GalT1, Jacalin lectin pull down assay was carried out. As shown in Fig. 6C, knockdown of C1GalT1 reduced Jacalin binding to β1-integrin in Eca109 cells. To support this, IP with anti-β1-integrin antibody and Jacalin lectin blot was performed. The data showed that there was decreased binding to Jacalin on β1-integrin in Eca109-si cells (Fig. 6D). However, the protein expression of β1-integrin was not changed by altering C1GalT1 expression (Fig. 6C). These results suggest that C1GalT1 regulates core 1 O-glycans on β1-integrin in esophageal cancer cells. As shown in Fig. 7A, knockdown of C1GalT1 in Eca109 cells resulted in significantly decreased focal adhesion kinase (FAK) phosphorylation (Tyr397). To explore the effects of the β1-integrin/FAK signaling on the radioresistance of esophageal cancer cells, β1-integrin-blocking antibody (P4C10; Merck Millipore, Billerica, MA, USA) and FAK inhibitor (FAK inhibitor 14; Santa Cruz Biotechnology) was employed. FAK phosphorylation was inhibited by pre-treatment with the P4C10 in Eca109 cells (Fig. 7B). Signaling inhibition by FAK inhibitor was also confirmed, as shown by the decreased expression of p-FAK (Tyr397) and p-Akt (Ser473) (Fig. 7C). 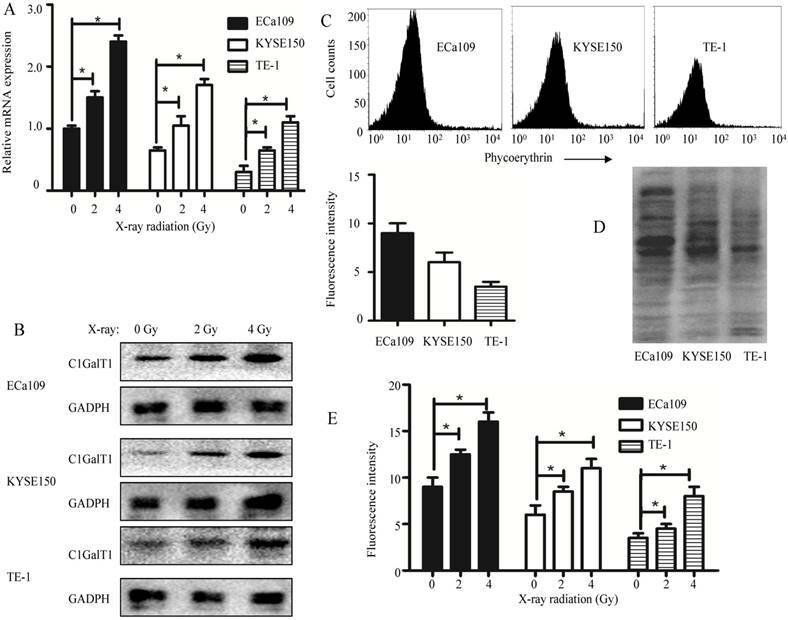 In addition, the apoptosis induced by X-ray irradiation was considerably enhanced by the pretreatment of P4C10 or FAK inhibitor in Eca109 cells (Fig.7D). 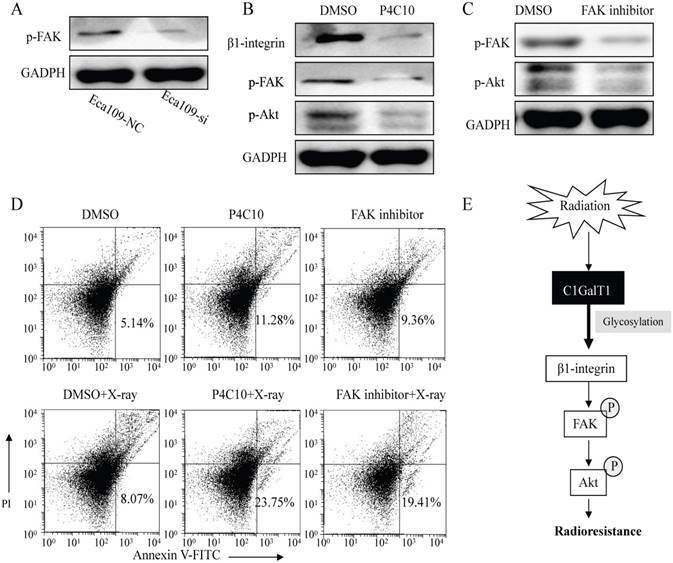 These findings suggest that C1GalT1 mediates the radioresistance of esophageal cancer cells through β1-integrin/FAK signaling pathways (Fig.7E). Knockdown of C1GalT1 blocks the radiation-enhanced invasiveness in esophageal cancer cells. Cells were irradiated at 0-4 Gy and grown for 24 h before the following experiments. (A) The scratch wound healing assay was performed in ECa109 cells. Data are expressed as the percentage of wound closure compared with the unirradiated cells (0 Gy). (B) Transwell invasion assay was performed to assess the invasive ability of ECa109 cells. Data are represented as ratios versus unirradiated cells (0 Gy). (C) Comparison of the migratory abilities of ECa109-NC and ECa109-si cells with or without 4 Gy irradiation. (D)Comparison of the invasion abilities of cells with or without 4 Gy irradiation. All the images were acquired at 100× magnification. *P<0.05, **P<0.001. C1GALT1 modifies O-glycans on β1-integrin. (A)Expression of core 1 O-glycans was detected by flow cytometry. (B) Core 1 O-glycans were analyzed by Jacalin lectin blot. (C) Cell lysates were pulled down (PD) by Jacalin and immunoblotted with an anti-β1-integrin antibody. (D) Cell lysates were immunoprecipitated with an anti-β1-integrin antibody and blotted with Jacalin or anti-β1-integrin antibody. **P<0.001. C1GALT1 is involved in the radioresistance of esophageal cancer cells via regulating β1-integrin signaling. (A) The p-FAK (Tyr397) expression was measured by western blot. (B) ECa109 cells were pre-incubated with 2 mg/ml β1-integrin-blocking antibody (P4C10) for 1 h. The expression of p-FAK (Tyr397) and p-Akt (Ser473) was analyzed. (C) ECa109 cells were pre-incubated with 10 mmol/L FAK inhibitor for 1 h. The p-FAK and p-Akt expression levels were analyzed. (D) ECa109 cells were pre-incubated with P4C10 or FAK inhibitor for 1 h followed by 4 Gy X-ray irradiation. The apoptosis of cells was determined by flow cytometry 48 h after irradiation. (E) Schematic representation of the proposed molecular mechanism of C1GALT1. In the current study, we demonstrated for the first time that C1GalT1 is involved in the regulation of radioresistance through modifying β1-integrin glycosylation in esophageal cancer cells. Cells with higher C1GalT1 levels exhibited stronger resistance to irradiation. Radiation also induced the upregulation of C1GalT1 and knockdown of C1GalT1 significantly enhanced the radiosensitivity of cancer cells. In addition, we investigated the expression pattern of C1GalT1 in esophageal cancer patients. Up-regulated C1GalT1 expression was correlated with TNM stage, lymph node metastasis and poor prognosis in patients. These results provide a possibility for exploring the function of C1GalT1 in improving radiotherapy treatment efficiency for esophageal cancer. Effects of radiation on phosphorylation, acetylation, ubiquitination, carbonylation, and nitrosylation in different tissues and biofluids have been studied extensively . However, there are only a few studies regarding the relationship between glycosylation and radiation. For example, using a large-scale quantitative mass-spectrometry-based glycomic approach, Chaze et al. found that several glycan families were down-regulated whereas others increased in the serum of locally irradiated mice.In another study, time and dose dependent alterations of glycoproteins containing galactose, N-acetylgalactosamine and mannose were reported in mice exposed to ionizing radiation using lectins. Lee et al. confirmed that radiation exposure enhanced the sialylation of cellular proteins in colon cancer cells by fluorescence- activated cell sorting analysis . Analyzing site-specific data of patients suffering from head and neck cancer, Toth et al. observed that intensity of 44% of glycoforms increased and 56% decreasedin in the course of radiotherapy .Targeted transcriptomic approaches in vitro in endothelial cells and in vivo in a radiation enteropathy mouse model proved that genes involved in N- and O-glycosylation were altered by radiation . In our work, mRNA and protein expression of C1GalT1 was induced by exposure to a low dose of radiation. Supporting this information, increased core 1 O-glycans after radiation exposure was also found in esophageal cancer cells. These results are in accordance with the previous experiments showing that radiation affected the expression of C1GalT1 and core 1 O-glycans . Hence, inhibition of core 1 O-glycans' formation, siRNA-mediated knockdown of C1GalT1 increased the radiosensitivity of esophageal cancer cells. Increasing evidence reveals that irradiation promotes the invasive potential in some cancer cells . For instance, radiation-induced invasiveness was observed in breast cancer . An enhancement of cancer cell invasion after radiation has been reported in pancreatic cancer . Our present study indicated that the increased invasiveness after irradiation was linked to increased expression of C1GalT1 in esophageal cancer cells. Thus, when C1GalT1 expression in esophageal cancer cells was downregulated, the invasive and migratory abilities were inhibited. The changes in the cell cycle distribution are one of the key factors regulating radioresistance . In this study, the percentage of esophageal cancer cells arrested at G2/M phase increased after irradiation. Knockdown of C1GalT1 abrogated the G2/M phase arrest caused by irradiation. Previous study indicated that inhibition of N-acetylglucosaminyltransferase V enhanced sensitivity of radiotherapy in prostate cancer by reduction of cell cycle G2-M arrest . This finding is consistent with our results that altered glycosylation affect the cell cycle distribution. Therefore, changes in cell cycle might be a factor underlying radioresistance after C1GalT1 knockdown. β1-integrin, the most widely expressed integrin subunit, is critically responsible for the progression, growth, and radioresistance of malignant tumors. Targeting of β1-integrin with inhibitory antibody increased the sensitivity to radiation in hepatocellular carcinoma . 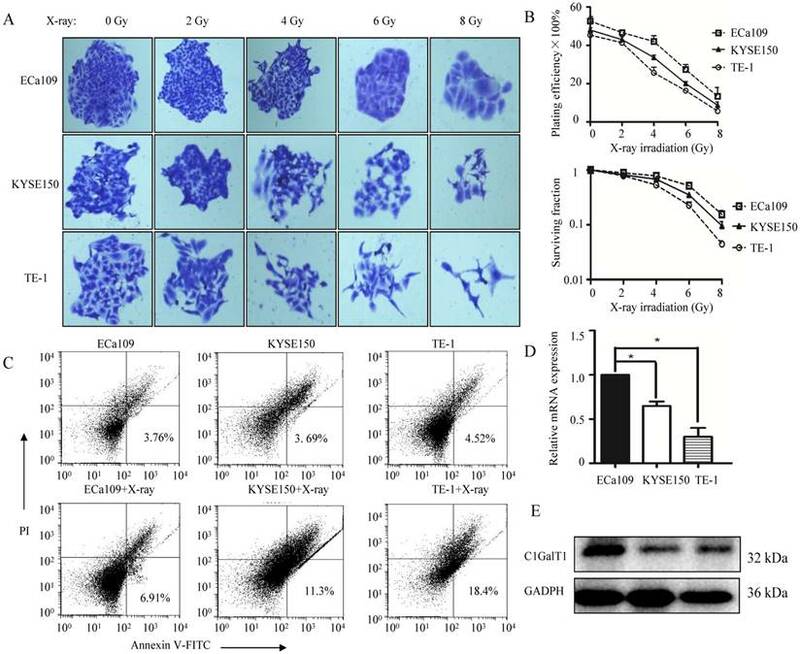 In addition, siRNA- or antibody- mediated downregulation of β1-integrin resulted in a dose- and cell line-dependent radiosensitization in head and neck cancer cells . Our study showed that the β1-integrin-blocking antibody had enhancing effects on the levels of apoptosis caused by radiation. A recent glycoproteomic research identified O-glycosylation sites on β1-integrin .Using IP and lectin blot assays, we confirmed that core 1 O-glycans on β1-integrin were modified by C1GalT1. FAK is a cytoplasmic tyrosine kinase recognized as a key regulator of intracellular signaling by β1-integrin . FAK signaling contributes to the proliferation and survival of cells and is therefore linked to the radioresistance of cancer cells . Furthermore, the phosphorylation level of FAK was inhibited in C1GalT1 knockdown cells. Pre-treatment with a FAK inhibitor promoted radiation-induced apoptosis in cancer cells. These results imply that C1GalT1 is an essential mediator of β1-integrin signaling in the radioresistance of esophageal cancer cells. Moreover, the mechanisms responsible for esophageal cancer radioresistance have been extensively studied. Yang et al. reported that RNF2 gene knockdown could reverse radioresistance in esophageal cancer ECa109 cells . Wen et al. showed that down-regulation of XIAP would strengthen radiosensitivity in esophageal cancer EC9706 cells . Another study found that c-Met played a critical role in the modulation of radioresistance in esophageal cancer TE13 cells . These data implied that different cells may display a dissimilar mechanism of radioresistance. Therefore, additional esophageal cancer cell lines would need to be investigated to confirm our results. Most importantly, C1GALT1 activity required the expression of a molecular chaperone designated Cosmc (core 1 β3-Gal-T-specific molecular chaperone) . It is well known that the mutation or loss of expression of Cosmc mediated aberrant O-glycosylation and promoted oncogenic properties in several cancers [42-44]. But the impact of Cosmc upon the radioresistance of esophageal cancer cells is still not well-understood. In conclusion, our results reveal a novel mechanism by which C1GalT1 regulates radioresistance. Our study suggests C1GalT1 as a target to improve the success of radiation therapy in esophageal cancer. This work was supported by the National Natural Science Foundation of China under Grant 81502666, the Initial Project for Post-Graduates of Hubei University of Medicine under Grant 2016QDJZR10 and the Natural Science Foundation of Hubei Provincial Department of Education under Grant (Q20162115; B2017118). Corresponding author: Dr Zhiguo Luo, Department of Clinical Oncology, Taihe Hospital, Hubei University of Medicine, 30 South Renmin Road, Shiyan, Hubei 442000, P.R.China. E-mail: zhiguo_luocom; Dr Li Shen, Department of Biochemistry, School of Basic Medical Sciences, Hubei University of Medicine, 30 South Renmin Road, Shiyan, Hubei 442000, P.R. China. E-mail: shenlihbcom.